Originally the Norwegian state postal service took over only the transport from town to town. Within the towns the people had to help themselves to forward the incoming mail to the correct recipient. For this purpose in 1857 the first public Bypost (local post) was founded in Christiania, followed by the cities of Porsgrund, Bergen and Fredrikstad. Private companies followed. By postal law of 1871, however, a private company was allowed to settle only where there was no state Bypost. Later, the state monopoly was established in the Postal Act of 1888 and the private Byposten had to close. Speculative stamp issues (without a need) by small villages brought the entire Bypost issues into disrepute. On the other hand Byposten in bigger cities with a large amount of mail are to be classified as serious and collectible. In Drammen, a city 43 km southwest of Oslo, there were 4 "official", private Byposten, which are listed in the catalogs of Carl A. Pihl and Bjørn Schøyen/Finnaune: Drammen I: G.O. Ulleberg/Ismael Bernhard Hagen; Drammen II: E.B. Eckholt. (Eckholts Bypost); Drammen III: Johannes Eriksen (By- und Pakkepost); Drammen IV: M. Børresen (Børresens Bypost). 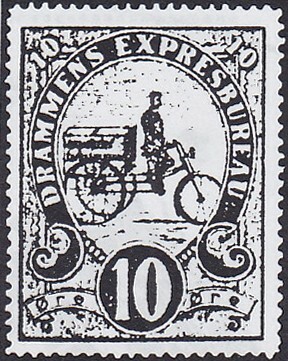 The Drammens Expresbureau stamp with the postman on the tricycle belongs not to one of the four "official" Bypost companies of Drammen but it is mentioned in the private mail catalog of Pihl. The black/white copy is from BS18A_11. Apparently there are two color variants: orange brown and carmine. If you know of another copy, please send a photo to contact[at]bicyclestamps.de so that this gallery can be expanded. This stamp issue is probably one of the rather rare bicycle stamps. Forschungsgemeinschaft Nordische Staaten e.V. Special thanks to Dr. Reinhard Meyer for the friendly support.